Another trip downtown, this time with a camera! Last week our good friends Pesty and Spanner (aka Piero and Ana) were in town, for those who know and love them they are once again roaming the world and we were lucky enough to host them for a while on their way to Manaus in the middle of the Amazonian rain forest. Like most people their only experience of SP was a brief stop over at the not so lovely airport, so Greg took them so see some of the sights around town before we headed for the coast for the weekend. 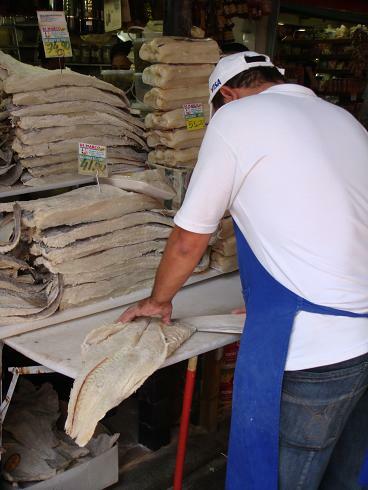 Of course no visit to SP is complete without a trip to the Mercado Municipal to try the awesome bacalhau pastel and our newest treat – some real Brasilian chewing tobacco, which was just as horrible as you imagine it will be. 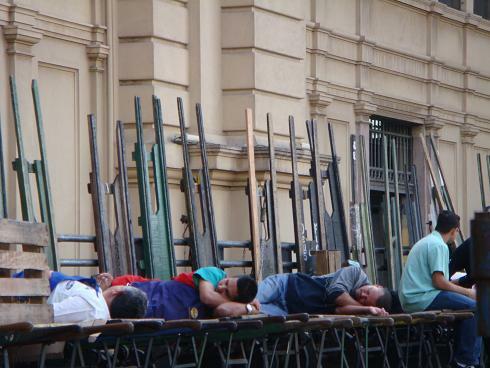 Piero had his trusty camera with him, so he got these great snaps around the market, the crazy 25th of March street and the quite nice if a bit shabby downtown business area which i know you are all dying to see! if this place doesnt make you hungry, you probably have a dodgy south american belly! 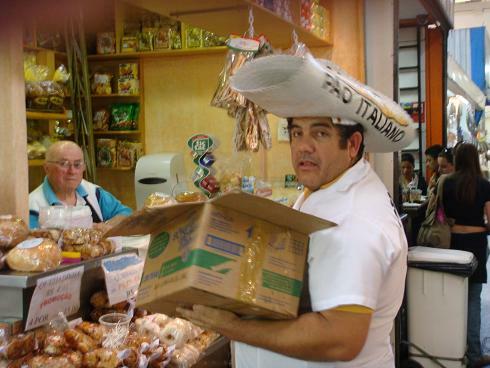 The italian bread man – who wouldnt buy something off this bloke? 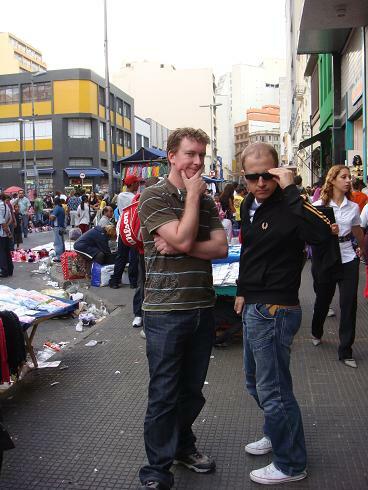 25th of March street – possibly the worlds craziest market – from nasal hair trimmers to samba costumes and carpets.. The dance floors full at 5pm, we must be in Brazil…. So after many weekends of travel and adventure around LatAm we were really looking forward to a bit quieter weekend exploring Sao Paulo. We started off Saturday with Paula, one of Caths workmates who was our tour guide for the morning. 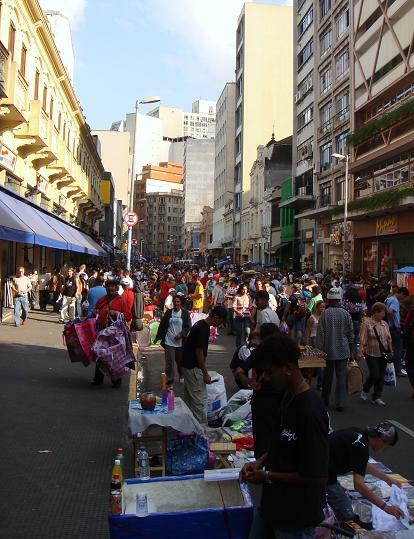 Paula took us to “downtown” to visit the Mercado Municipal – Sao Paulos biggest food market. 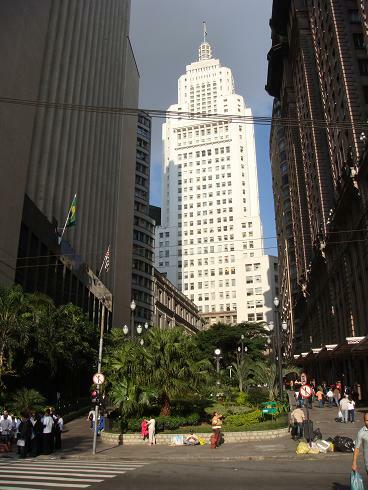 It may seem a little odd, but after three months in Sao Paulo we have never visited downtown – the centre of the city. 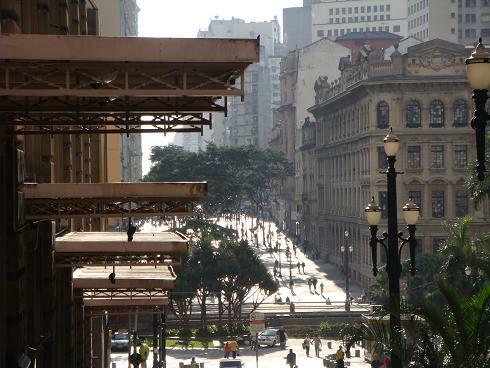 The centre of Sao Paulo is a maze of small streets, full of old buildings, has many green parks, but as with many of the bigger cities in LatAm the centre has been virtually abandoned in the last 20 years. 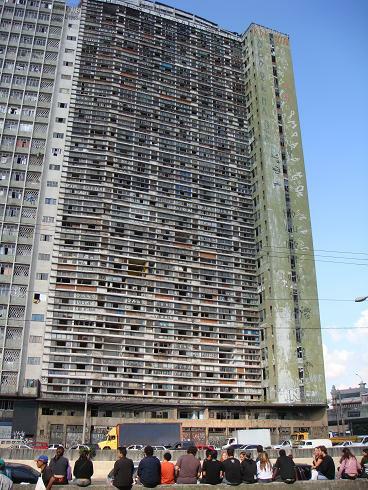 Despite all of the factors that could add up to make the centre of Sao Paulo beautiful and scenic, many of the buildings have been abandoned, others are simply falling to the ground, its dirty, full of rubbish, covered in vandalism, there a shacks and shanty towns tucked into many of the corners, and the poor and homeless are everywhere. All in all it’s a pretty depressing place, the locals advised us not to bother visiting, the guide book tells you to avoid it and our friends drive through with their windows wound up and their doors locked. I will head back down another time with my camera to try and capture the scene, but I am pretty sure you can imagine it. 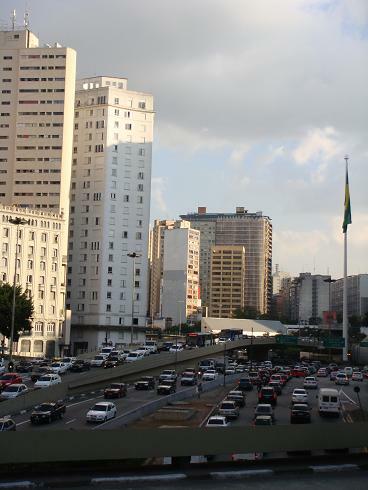 Contrasting downtown Sao Paulo with the area that we live in is amazing, sure we have some homeless families living near us, but we also have dog manicurists, children’s hairdressing salons, book shops and bakeries with valet parking and buildings with helicopter pads on the roof. 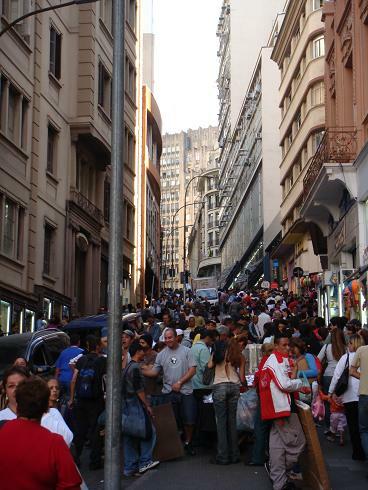 I don’t think we will ever quite get used to the extremes of Brazilian society. So on our way to the Mercado municipal we passed by the infamous Rua 25th March, this street which is right near the very posh indoor central market is a massive street market at the other end of the price scale, it’s really quite manic, the shops are in decrepit old buildings (crying out for renovation) but as well as the crowded shops, the footpaths and the road are crammed with people buying and selling everything. 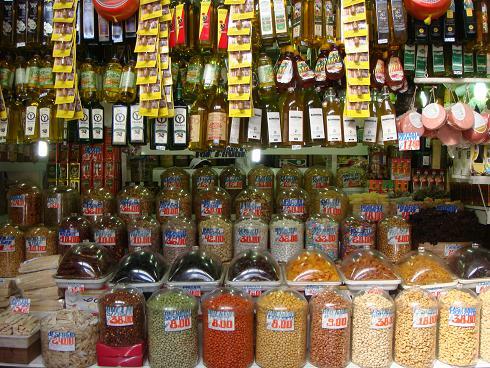 I am pretty sure you could just about buy anything you can imagine there, some of the highlights for me were a shop full of 1,000 varieties of coat hangers and a street vendor selling corn juice – yummy not! 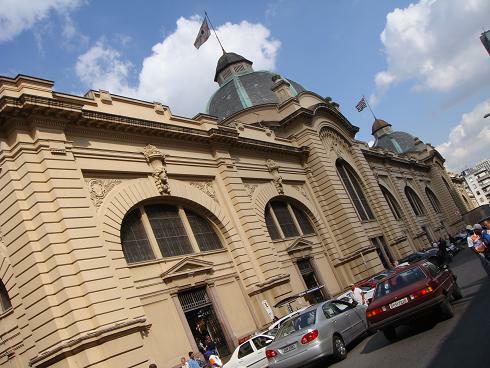 So the Mercado Municipal is a massive undercover food market, crammed with butchers, fishmongers, fruit and veggie stalls and restaurants and bars, it was awesome, again you could buy almost anything here, but this time just in the world of food. With the help of our guide Paula we ended up buying a ton of fruit, all weird South American varieties none of which we had seen before, none of this stuff was cheap, though, and we ended up spending £50 on fruit and in total we probably only got 2 dozen individual pieces… The other thing that the mercado is famous for is its bacalhau and mortadella sandwiches, now for those who aren’t up on their traditional Sao Paulo foods, a pastel is a deep fried pastry pocket usually filed with beef or cheese and mortadella is an Italian meat (like a posh version of luncheon from New Zealand). So there are only two real dishes to eat, either a pastel filled with bacalhau (a chunk of dried salted cod from Norway) or two pieces of white bread wrapped around 500grams of mortadella. For me the choice was pretty easy, 500 grams of luncheon meat, or some yummy fish, so I had a pastel, I think it was a bit early in the morning for Cath who opted for a much less stomach churning Portuguese custard tart! So on Saturday afternoon we had a completely different view of Brazilian culture, with two more of Caths workmates, Renato and Danilo we headed to a venue called Traco De Uniao, our instructions were to be there at 2pm to make sure we got a seat, now I was a bit sceptical of any venue that you have to be at early to get a seat, and sure enough we arrived at 2pm and the place was virtually empty. The bar was very basic, its apparently modelled on Favela bar, it had an area for the band to set up in the middle, not much in terms of decorations, cheap and cheerful tables and chairs, and a concrete grandstand along one wall. My initial impressions were a little disappointing, this place was totally empty, and it didn’t really ooze atmosphere, but as usual, little did we know what we were in for! We started off with some beers for the boys, and a caipirinha or two for Cath, then we had a great feijoada – the national dish of brazil, as discussed in an earlier post, is quite a feast, lots of meat, rice, beans, fried banana, sausage, washed down with caipirinhas and beer. By the time we finished lunch the place had really started to fill up, and by 3pm it was packed, there was a salsa band belting out hit after hit and the place was heaving. The great thing was that this wasn’t some tourist show (we all remember senor tango don’t we) this was just 500 Brazilians all about our age having a great party and we certainly joined in, we danced, we drank, we partied, and let our hair down like we haven’t since we arrived in Sao Paulo. Thanks Paulo, Danilo and Renato for a great weekend!